The feedback circuit in any amplifier determines many of that amplifier's characteristics. For "simple circuit" designs of tube amplifiers it is usual to take feedback from the secondary windings of the output transformer. The feedback characteristics can therefore be altered by a complex loudspeaker impedance connected to that amplifier and the performance of that amplifier will be changed as a result. This is the main reason why so many amplifiers are unable to drive loudspeakers with complex impedances to listenable levels without degradation of sound quality. With the McIntosh Circuit design from Papworth Audio Technology there is no feedback taken from the secondary windings of the output transformer. Put simply, this means that the amplifier will drive any loudspeaker without it's own performance characteristics being affected by the loudspeaker impedance. All Papworth Audio Technology Power Amplifiers have highly developed McIntosh Circuitry and it is therefore quite possible to drive loudspeakers with complex impedances and low efficiency with perfectly satisfactory results. 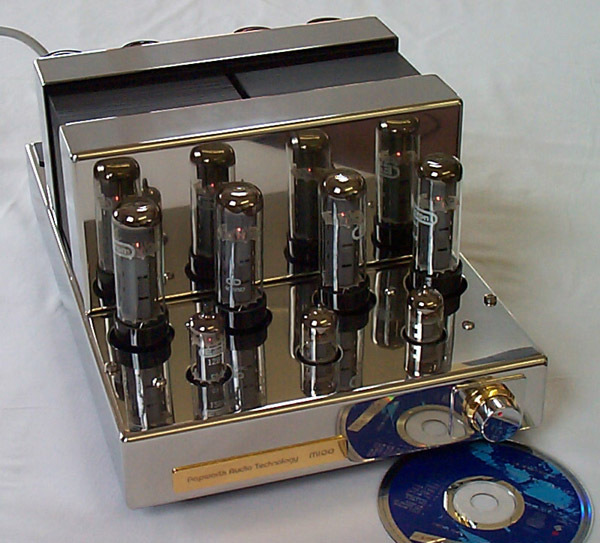 The tube monoblocks are made with chassis and transformer covers formed from two millimeter thick hand polished stainless steel. Front panel logoplates are pure gold plated, and laser etched for the finest appearance. Safety covers, legend plates, and base plates are rust protected and painted in black silk finish. M100 Uses two pairs of EL34 pentodes to deliver over 120 Watts RMS into 8 ohm or 4 ohms.This amplifier has been in continuous production for almost twenty years. The current production model is wired in many critical areas with multistrand silver plate cables, and fitted with WBT full specification loudspeaker terminals. The four large british BHC electrolytic storage capacitors have a total capacity of 2800 microfarads for excellent transient response. The custom wound mains transformer is rated at 400 VA for a long and trouble free life. Our output transformer, also 400 VA, is sectional wound with eleven separate sections to achieve a very low leakage reactance. This allows a flat response from 14 Hz to over 30 KHz, with a deviation of less than plus and minus 0.2 dB. At 100 Watts rms output it achieves better than 0.18% total harmonic distortion. M200 Uses four pairs of EL34 pentodes to deliver more than 240 Watts RMS into 8 or 4 ohms. Built with all of the features described for the M100. This amplifier has won major awards in Italy and Japan where audiophiles insist on only the best. One example of the conservative specification of this product is the 700 VA output transformer weighing 13.5 Kgs which delivers in excess of two hundred watts at frequencies below 10 Hz ! M300 Introduced in early 1998, this new product uses four pairs of KT88s to deliver more than 320 Watts into 8 ohms or 4 ohms. This amplifier is totally hand wired throughout, with heavy PTFE coated, multistrand silver plate cables in the signal paths. It can drive and control all known loudspeakers. M400 Not yet in production ! . It is to be a "two chassis per monoblock" system with the power supply sitting separately and below, the power amplifier stage. Our prototype uses six pairs of KT88s and produces more than 500 watts into 8 or 4 ohms (why didn't we call it M500 ?). 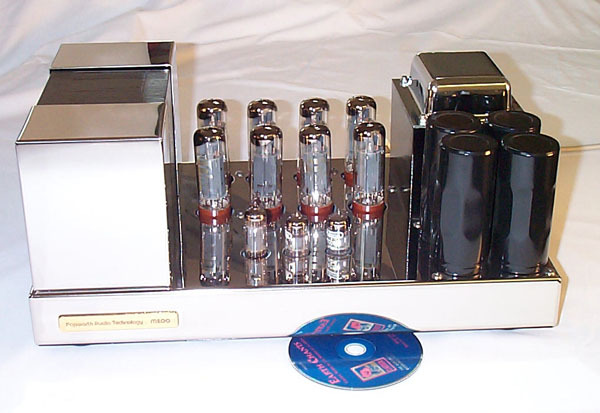 It may be the worlds most powerful stack-tube power amplifier ! Size:- 460 mm wide, 480 mm high (both sections stacked), 460 mm deep. Weight 63 Kgs per monoblock.